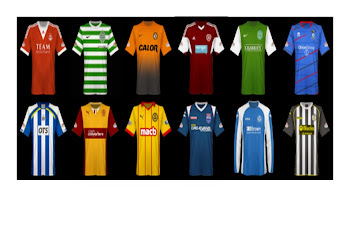 Narey's toepoker - a Scottish football blog: Another lost decade? Isn't time supposed to be a great healer? Well, for most Scots, watching Euro 2016 is becoming more painful, not less. Wales have won a game. Northern Ireland have won a game...with a squad that contains more SPFL players than Gordon Strachan would pick for one of his Scotland squads. And Iceland drew with Portugal. Iceland, which has a population slightly smaller than that of Fife. I wonder how a combined Dunfermline/Glenrothes/Kirkcaldy XI would have got on against the Portuguese. One wag on Twitter suggested that the Fife team "would win at shoplifting". So no wonder there is an awful lot of wailing and gnashing of teeth coming from the Tartan Army just now. It's eighteen years - more than half my life, depressingly, since we last reached a major tournament. Out of all the other UEFA countries that have previously qualified for a World Cup or European Championship (and still exist) only Israel have waited longer...and they weren't part of UEFA when they qualified for a World Cup. The itch isn't ending any time soon, I'm afraid. As much as we hold on to the romantic prospect of stuffing England, our qualifying group for Russia 2018 is a killer. Euro 2020? That'd be great, given that Hampden is getting to host some games. But the truth is that, as hopeless as the national team is now, it's likely to be even weaker by then. Things are bad enough now - so bad that geriatric Gordon Greer, released by Brighton at the end of the season, is still considered a viable option at centre back going into these qualifiers. The only Scots likely to be regulars most weeks for English Premier League clubs (a pretty reasonable barometer for quality, in my opinion) are Allan McGregor, Andrew Robertson, James McArthur, Darren Fletcher, James Morrison and Matt Ritchie. The former two are with a newly promoted side. And depressingly, the latter two are Scottish only by distant ancestor. Oh, and Fletcher is 32. But we have lots of youngsters coming through right? Um, er, well, er, no we absolutely do not. Eight players currently aged under 23 have Scotland caps: Robertson, Kieran Tierney, Stephen Kingsley, Callum Paterson, Oliver Burke, John McGinn, Barrie McKay and Tony Watt. How many of those do you think could establish themselves at a club in the English Premier League in the future? Not many, I reckon. The most likely candidates are the former three...all of whom play in exactly the same position. So unless we find a formation which involves playing several left-backs (over to you, Craig Levein) it doesn't look good. The 2010s are going to be a lost decade for the Scotland national team. Part of that is down to massive failures by the managers, Craig Levein and Strachan. In turn, one could also blame their employers for such rotten appointments, though the failures of Strachan were harder to predict than those of Mister 4-6-0. Northern Ireland are reaping the rewards of appointing a talented manager who can make the team far more than the sum of their parts due to organization and attitude. But the lack of quality players can't be laid at their door. Take Iceland, and it's population of 300,000. There have been a wealth of articles explaining their success in developing players; it comes from an enormous investment in facilities and coaching. Every school seems to have a full-size artificial pitch, and a large indoor pitch. Kids from the age of 3 upwards play several days a week, taught by coaches with UEFA licences which are funded by Iceland's FA. There is one qualified coach for every 850 people in Iceland. In Scotland, where coaches have to pay four figure sums out of their own pockets for courses, that ratio is about one for every 12000 people. And, of course, our facilities are rather less impressive. In Inverness for example there are just two full-size artificial pitches and nothing indoor that is better than a gym hall. There is one indoor astro pitch in Dingwall, I suppose. I mentioned this to my father the other day, and his response hit the nail on the head. "That's because football isn't a business in Iceland". That may not be completely accurate, but it explains sufficiently why making clubs responsible for youth development isn't a wise move here. Academies cost a lot of money; how many gems worth seven figure sums are they going to produce each year? There's also the short-term need for first team success; signing a veteran player often seems a safer option than risking an untried youngster. Even Celtic, with their desperate need for Champions League football, haven't felt comfortable blooding youths (Kieran Tierney is the exception) during their four years of barely-contested dominance. Maybe I'm being overly optimistic, but the signs are that Brian McClair, the new performance director, has identified this. His moves to heavily streamline youth coaching so that a smaller number of more elite kids are looked after by a smaller number of more elite coaches looks like the right way to go. Whether the clubs - each of whom still believe they will unearth and unleash the tartan Gareth Bale, and therefore make a mint, without putting in enough money and effort to do so - will agree is another matter. It's also not clear if the SFA will throw their weight behind McClair here. Stewart Regan says the right things, but that has been the characteristic of his tenure as Chief Executive - lots of clever-sounding words (I bet he even uses buzzwords in conversations with his family) but barely any action. There's no doubt that there is no quick solution to the Scotland national team's travails; the current doldrums will continue for a few years yet. But decisions taken now will determine whether the 2020s end up being a lost decade as well.